Two actual kalimba/mbiras from DARIA's live music shows. Leah from the Almost Unschoolers blog decided to take on the project of creating a homemade mbira (kalimba) while studying Kenya with her kids. A complete list of supplies and tools she used for this craft are listed below plus a link to her inventive and creative blog. Leah started with a block of wood and added two popsicle sticks to it with hot glue. 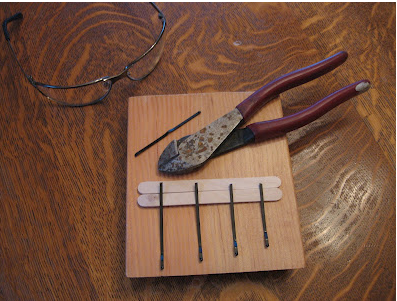 This would create an area where the bobby pins would be higher then the wood block so they could be plucked. After cutting the bobby pins in half, she shortened each one just a bit. By doing this, the variation in length would create a slightly different sound for each “tine” or bobby pin when plucked. Leah used four bobby pins here but you can experiment with any number of bobby pin “tines”. Then she taped the bobby pins in place in the order she wanted and hot glued two more popsicle sticks on top. She tightened the sticks by adding pushpins. Finally, she bent the bobby pins up to about a 45 degree angle. At that point, the little instrument was ready to play. Her kids jumped right in and began to pluck and play. Although, it didn’t sound exactly like the kalimbas or mbiras they had checked out in sound clips on the internet, it still was a good working instrument that was fun to explore. It also was a great experiment in encouraging kids to think about how instruments were invented or improved using only the simplest of materials. This entry was posted in Africa, Crafts, Earth Friendly Music, Musical Instruments, Uncategorized and tagged African instrument, African instruments for kids, bobby pins, crafting instruments, diy, homemade kalimba, homemade mbira, Kalimba, mbira, mbira kalimba, multicultural instruments, musical instruments, unusual musical instruments by dariasblogs. Bookmark the permalink.